Memphis acts like he's never had a bad day in his life. Granted, he's only been walking the planet for about 4 months. He and his adorable sister Dusty came to Sachi with their Boxer mama, Phaedra. We don't know anything about the pups father. 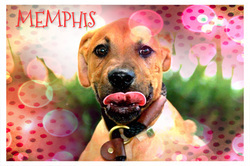 Memphis is one confident little guy and makes friends with anyone and everything. Nothing short of the best home in the world will be suitable for Memphis!